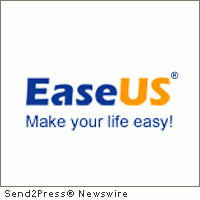 NEW YORK CITY, N.Y., Aug. 19, 2011 (SEND2PRESS NEWSWIRE) — EaseUS Software, a leading provider of easy-to-use storage management, data backup and system disaster recovery solutions, announces EaseUS Todo Backup Advanced Server to safeguard Windows 2000/2003/2008 Server and Microsoft Exchange and SQL Servers against data loss as well as system crash, maximizing uptime of servers. Continuing its advanced server backup functions like incremental backup, universal restore, and WinPE bootable disk, EaseUS Todo Backup Advanced Server has added new features to safeguard the Exchange and SQL Servers, such as differential backup, one-click system backup and recovery, save backup image to tape, install EaseUS Todo Backup without rebooting the system and interrupting your jobs, etc. It’s an essential tool for server administrators to backup system state and critical data, minimizing the downtime if server fails. EaseUS Todo Backup Advanced Server offers an easy administration with an intuitive wizard-driven GUI. It also offers more backup tools than the built-in backup functions of the Windows Server Operating System and can handle complex scheduling scenarios and backup to tape devices. * Exchange Server backup – easily backup and restore MS Exchange Server 2003, 2007, and users can be back to work sending and receiving e-mails in seconds. * SQL Server database backup – full backup SQL database and log without interrupting MS SQL Server running. You can also backup and restore one or more databases simultaneously. * Advanced backup scheduler – automate regular backups for a “set it and forget it” backup and protect the server at any time. * Disk and partition clone – clone or transfer a hard disk, partition or dynamic volume to another. * Conveniently install program without system rebooting. EaseUS Todo Backup Technician for $799.20 (originally $999) is available at: http://www.todo-backup.com/business/technician-backup.htm . EaseUS® is a registered trademark of CHENGDU Yiwo® Tech Development Co., Ltd. Original Keywords: server administrators, EaseUS Software, EaseUS Todo Backup Advanced Server, EaseUS Partition Master, EaseUS Todo Backup, and Data Recovery Wizard, backup functions of the Windows Server Operating System, back-up, one-click system backup and recovery, save backup image to tape EaseUS Software New York City New York NEW YORK CITY, N.Y.
Alternate Headline: EaseUS Todo Backup Advanced Server announced by CHENGDU Yiwo Tech Development Co., Ltd.
REFERENCES: Business News, server administrators, EaseUS Software, EaseUS Todo Backup Advanced Server, EaseUS Partition Master, EaseUS Todo Backup, and Data Recovery Wizard, backup functions of the Windows Server Operating System, back-up, one-click system backup and recovery, save backup image to tape EaseUS Software New York City New York NEW YORK CITY, N.Y.